Transit City and transit in general are much in the political news thanks to one mayoral candidate’s declaration that there would be a moratorium on additional routes among other changes at the TTC. Christopher Hume’s column in the Star gives an overview of the landscape. In the midst of TTC problems from lousy customer relations to service reliability, from Enbridge cutting into the subway tunnel to a maladroit handling of the recent fare increase, everyone needs to step back a moment and divorce the TTC from the politicians. Transit City has many good points, and they need to be reinforced, not simply tossed aside as part of the anti-Miller rhetoric brewing in some campaign offices and newspapers. Transit City isn’t perfect, but the map may as well be cut into stone tablets rather than being a living document to hear some of its supporters. Such inflexibility undermines the plan itself. There’s an odd parallel to Metrolinx’ Big Move plan. Metrolinx claims that their plan is a work in progress, but just try to criticize it, try to suggest changes, and their professed love of public input evaporates. Transit City isn’t quite as bad, and we are at least having some public feedback through the Transit Project Assessments. However, some fundamental changes are needed. Four years ago today, stevemunro.ca came to life as what I thought might be a handy, small blog where I could make available comments and analysis on a variety of (mainly) transit issues. It didn’t quite work out that way, and I’ve been quite pleased at the way this site has grown as a forum. Daily page views are now sitting in the 2-3,000 range, although the all-time high (4,723) arrived on the day I published the old GM “New Look” product literature. I think the gods of blog activity are having a laugh at my expense with the most popular post being one about buses. Some people don’t like the fact that this is a pro-LRT site. That’s their privilege. I am not against subways or buses, but each mode has its place, and for far too long Toronto (and Queen’s Park) ignored what hundreds of other cities are doing. The subway and LRT camps need to view transit improvement as the goal, rather than arguing a zero-sum game in which any “gain” for one mode is a “loss” for the other. The heart of this site is the readers and the comments they leave. Back in April 2009 came the landmark of 10,000 active comments. We will hit 15,000 early in February. All those comments make for a lively conversation whether we agree with each other or not. I think this improves the general quality of transit advocacy in Toronto because people get to read about and discuss issues in depth. This blog is well read in professional and political circles, and I have often been complimented on the quality and range of the discussions here. It’s not just the pearls of wisdom, such as they may be, from my electronic pen that attracts such an audience. Thank you to all the readers. Without your contributions, this would be a rather quiet place. 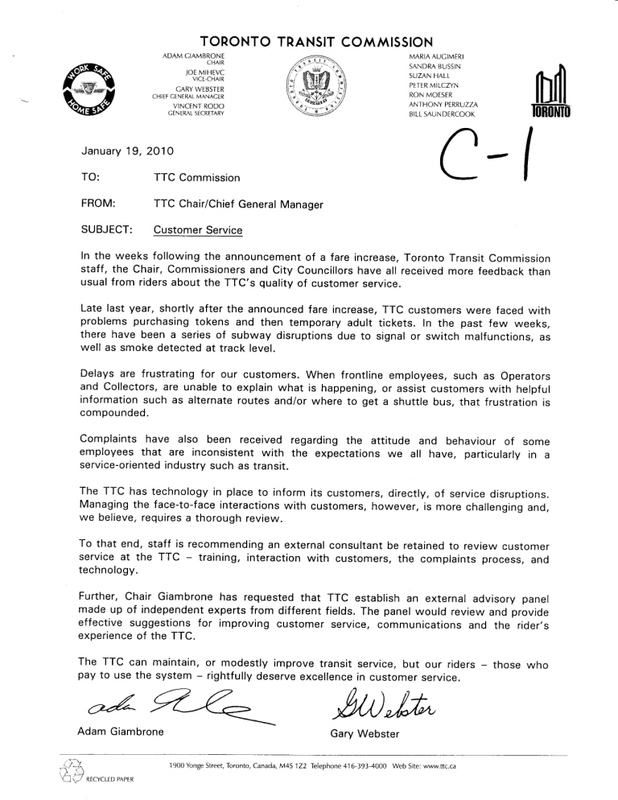 On January 27, the TTC announced a number of new programs and policies designed to substantially improve all aspects of customer service. I won’t go into all of the details, but for those who have not seen them, you can follow the links below. This will probably be the last transit announcement by Adam Giambrone who is widely expected to announce his candidacy for Mayor of Toronto next Monday. Once that happens, he cannot maintain a high-profile position and use the TTC for electoral good news. 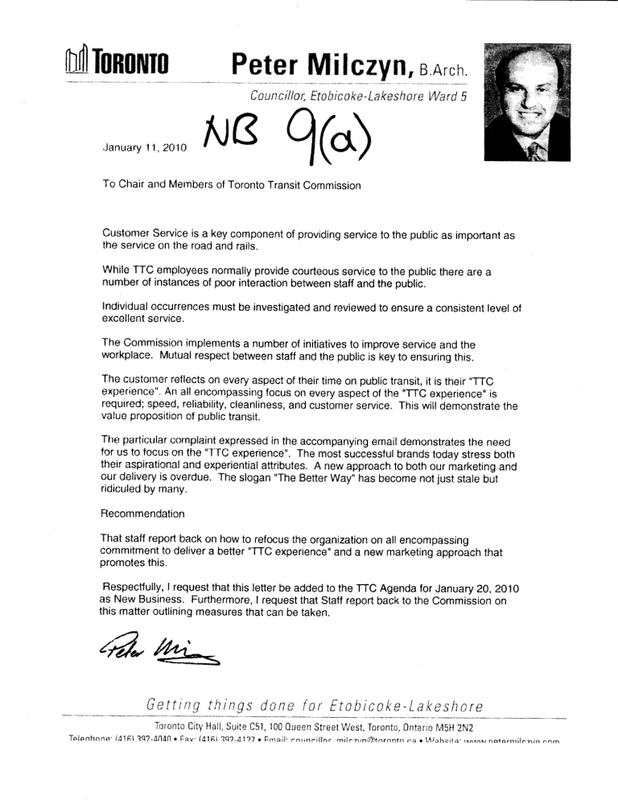 In his introduction of the new program, Giambrone talked about four essential parts of TTC customer service: courtesy, information, responsiveness and reliability. Some of these are “people skills”, some are technical, but many require changes to organizational culture. Just making the trains run on time isn’t enough (although I suspect many riders would be happy just for that small miracle). The TTC will create an external panel of customers, employees, and others outside the TTC with a customer service background. The work plan sounds depressingly like so much public consultation. First there will be a terms of reference, then the panel will review current plans, consult the public and draft a “bill of rights” for transit customers. This process is hoped to wrap up by June 30 — an unusually fast schedule for consultation and reporting. For the record, I have neither applied for nor been invited to be a member of the panel. The TTC plans a number of technology-related changes to improve information flow including screens showing information about service status at subway entrances, real-time vehicle information via SMS (text) messages, new microphones at collectors’ booths to improve conversational quality between staff and passengers, an internet trip planner, and completion of next vehicle information throughout the subway. We know that the GPS-based line displays have been available internally for some time. The TTC included a view of one as part of a recent presentation, and real time trip information cannot work without the underlying data. Why are these not available to the public? A significant omission in the vehicle tracking system is knowledge of the advertised destination of a vehicle. Like so much else in TTC operations, the only available information is the scehduled destination. However, this is meaningless on routes with frequent short-turns and ad-hoc service restructuring. Someone waiting for a car wants to know where it is really going, not where it is scheduled to be. The trip planner is still at a beta-testing stage (comment threads on other sites have talked about various peculiarities in early versions), but it will be released with the clear intent of getting customer feedback. This will be an early test of the TTC’s intentions because bug fixes and enhancements will be essential to having a really good product. I will not discuss the relative merits of the TTC’s system and other available software, although one wonders why the TTC went down the “roll your own” path on this project. Once the TTC version has actually been up for a while and had some fine tuning, then we can get into comparative discussions about other products. The TTC plans to add 50 new pass vending machines at locations in the system and to expand the use of debit/credit car transactions. I hope that, while they are rewiring stations, they take into account future needs for Presto so that they don’t have to tear everything apart in a few years’ time. Indeed, the idea of provisioning new equipment when we are close to a system-wide conversion to automated fare collection begs the question of how serious the TTC really is about the latter. One big complaint about TTC information services is their availability during business hours only. The TTC hopes to incorporate a complaints line into the City’s 311 service so that customers can call in immediately when an incident occurs. The TTC should simply ditch its own info line and make transit information part of 311, transferring staff if necessary to the City operation. Passengers expect cleaner stations. Report after report showing how Toronto’s mythical “station cleanliness index” is inching up year by year simply are not enough. There are now plans in the TTC budget to beef up the cleaning staff, but even this is a multi-year scheme. Don’t expect spotless stations soon. Good customer service is to be an organizational goal. After several years’ focus on safety and absenteeism, the TTC will now look to its customers. They should never have looked away. Particularly striking in the list of goals is “reliability”. This is the heart of good transit service, and it removes many of the annoyances that plague both riders and operators. The TTC must stop finding excuses for poorly managed and operated services. If changes in scheduling rules are needed to substantially reduce short turns, then find out how to make this work. Don’t tell us about all the added route supervision, show us the service evenly spaced out rather than running in packs. The operation of the St. Clair car since it reopened to Lansdowne is a disgrace. This was not even mentioned during the press conference. The TTC did talk about the subway shutdown brought on by Enbridge Gas construction work. This incident revealed not only a problem with clear communications, but with emergency preparations in general. Certainly, buses can never replace the subway particularly at the peak time. However, the first thing that should happen in this type of situation is the closure of an affected street like Yonge to all non-essential traffic so that buses can move as quickly as possible. The TTC, City and Police do not appear to have a standard protocol for this type of situation, and it’s badly needed. Without question, there are employees whose public manner leaves much to desire, but they are, in my experience, a minority. Both passengers and employees are made all the more sensitive and aggressive when they must deal with irregular service and an almost total lack of information. Fix those problems, and some of the contention between riders and staff will disappear. It won’t be perfect, but those employees who want to do a good job need to see that management is actively trying to improve their lot. Many of these initiatives will take time to be implemented on the street, and a review committee must exist long enough to compare promises to reality. The TTC is not a credible evaluator of its own success, if only because it has ignored its problems far too long. At the Empire Club today, Mayoral candidate Rocco Rossi proposed that all of Transit City, except for the Sheppard East line, be put on hold pending a financial review. Rossi may not be familiar with local issues, but he should at least know that Queen’s Park (and, for Sheppard, Ottawa) is paying for these lines, not the City of Toronto. There are issues with Transit City about which I will write in coming days, but stopping the projects is hardly the correct approach. It smacks of simplistic anti-Miller campaigning — whatever David Miller did must be wrong and so we’ll stop, or at least slow down, the plan. I will be generous and assume that the candidate may be badly advised, but this is the second gaffe of Rossi’s platform (the first is the proposal to sell Toronto Hydro), and I can’t help thinking he’s headed for an electoral graveyard. Updated 11:30 pm: I am advised that Rossi is aware of funding from other levels of government, but is concerned about future operating costs. He might start by looking at the extension to Vaughan which is expected to increase net TTC operating costs after any incremental fare revenue by well over $10-million annually when it opens. The projected riding north of Steeles Avenue is lower than on the Eglinton LRT. The supplementary agenda for January’s TTC meeting includes a report on the various experiments with Queen car operations. Unsurprisingly, it concludes that the split route operation was an abject failure, and recommends that the “step forward” crewing technique be formally implemented on the route during periods when the line is subject to disruption. This scheme keeps operators on time but allows vehicles to continue without short turning. I will not comment in detail on this report until after the Commission meeting and any discussions there. At this point, I am still waiting for vehicle monitoring data for October and November 2009 so that I can perform a detailed analysis of the split and “normal” operations. Because this report deals only with the various operational models actually tried to date, there is no discussion of alternative route structures such as splitting off the 507 in some form as a dedicated Long Branch service. I suspect that any mention of this would trigger a “we tried to split the route and it didn’t work” response even though the Dufferin/Broadview split was a completely different design than, say, a 507 service to Dundas West Station. This post will be updated with further comments or information when available. At the December 2009 TTC meeting, a question arose about the proposed delay of the Finch West construction to 2011 when so many projects serving the east end were to be accelerated in the name of the Pan Am Games. TTC staff explained that Metrolinx had wanted to defer the Finch West start date, but this didn’t sit well with the Commission. A report on the situation is on the TTC agenda for January. This report makes three important points. Some preliminary construction work for bridge widening at the West Don River (east of Dufferin) and the Humber River (at Islington) is possible in 2010 subject to funding. Property acquisition is another task that can be undertaken early in the project. Metrolinx wants the Finch West project to be handled as Design-Build-Finance (DBF) where a bidder accepts responsibility not just for constructing a line, but for a substantial part of the design work and project financing. The TTC wants to keep some of the project in house (notably the junctions between the Finch LRT and the YUS at Finch and Finch West Stations). The TTC and Metrolinx have exchanged letters (Appendices A and B in the report), and I am intrigued to see that Metrolinx is worried about cash flow if work planned for 2011 is brought forward. The FY 2010/11 budget for Finch West assumed continuing preliminary engineering, real estate acquisition and some early utility relocation activities to clear the way for the design-build contractor, but no major construction activities. … our overall funding and cash flow assumptions may not allow advancing some construction activities to 2010. It’s amusing to see that even Metrolinx, an agency that once talked of multi-billion dollar plans as if money grew on trees (or rather the money that would come from “Alternate Financing” sources), is now worrying about cash flow just like every other government. The problem here is that the bridges are already City property, and Metrolinx cannot wish away the cost of widening them as an accounting trick where the infrastructure is held as a long term asset by Queen’s Park rather than paying for the widening as a current expense. As for the method of tendering and managing construction at the two subway interfaces, the TTC appears unhappy with giving away control of this work. At Finch West, this would really make sense if the station and the LRT interface were to be tendered as one piece of work within the subway extension project. The station design is included in the printed agenda distributed to the media last week as item 2b, but it is not included online. At this point, the design shows only a proposed connection between the two stations. The desire for control at Finch Station no doubt relates to underground construction around the existing subway station. However, as I have discussed elsewhere, there is still good reason to rethink the placement of Yonge Station on the Finch line, and a final decision about who will actually manage this part of the project is not needed immediately. From a political point of view, the TTC and City are more than a little miffed that Metrolinx is suffling the construction schedules around. To a point, I sympathize, but only in that these events show just how constrained Metrolinx is by the money Queen’s Park is making available. AFP was supposed to solve this financing problem, but clearly Metrolinx plans are in the same cash flow straightjacket as the TTC’s. What will this mean for the future of transit expansion in the GTA? Are we back to “everybody loves transit, but nobody wants to pay for it”? TTC staff will brief the Commission on their discussions with Metrolinx at the January 20 meeting, and I will update this post with any additional info when it is available. The January TTC agenda includes a report about the lessons learned from the St. Clair construction project and their implications for work on Transit City. TTC considers the St. Clair Streetcar experience as an important stepping stone in the evolution of LRT in Toronto which began with the Spadina LRT, then Harbourfront LRT to the St. Clair project. This invaluable experience is an important guide in the delivery of the Transit City program. That’s not saying much. Toronto has now built three pseudo-LRT lines over two decades. The first, Harbourfront, is due for a major redesign with the reconstruction of Queen’s Quay. That line also features a connection at Union that was woefully inadequate for the demands placed on it, despite claims to the contrary by TTC engineers. The Spadina LRT, a scheme that took 25 years from proposal to implementation, was a bit better, but like Harbourfront, still suffered from traffic signal timings that favoured road over transit operations. This has still not been fully addressed even though the line opened in 1997.